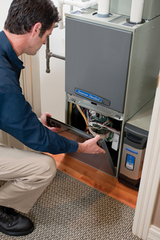 Sinclair Heating and A/C, Inc. specializes in Residential & Commercial, both new and replacement. We service all makes and models of equipment, and our service technicians are certified. We service all of the above, have maintenance contracts, extended warranty contracts, financing options with approved credit, and prompt, friendly techs and installers. Sinclair Heating and A/C, Inc. is a family owned and operated company.